Everyone with sight is born with a clear lens that allows light to pass through, giving individuals the ability to see. As we begin to age that lens begins to yellow and harden, which causes a decrease in vision. When this lens becomes cloudy, it is referred to as a cataract. 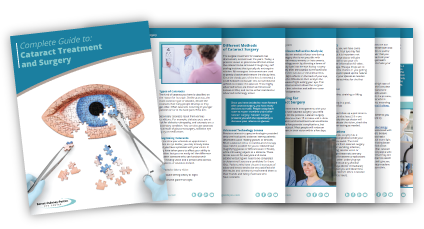 In addition, the guide details what's involved in the cataract surgery recovery process, including anticipated recovery time, and potential side effects that might occur after surgery. "It's really made a better change for me, to do this procedure." "Before, if I was looking at your face, it was just a blur. I couldn't see if you were smiling. I couldn't even see your eyes. After the surgery, I could see right away. It was clear and just amazing."